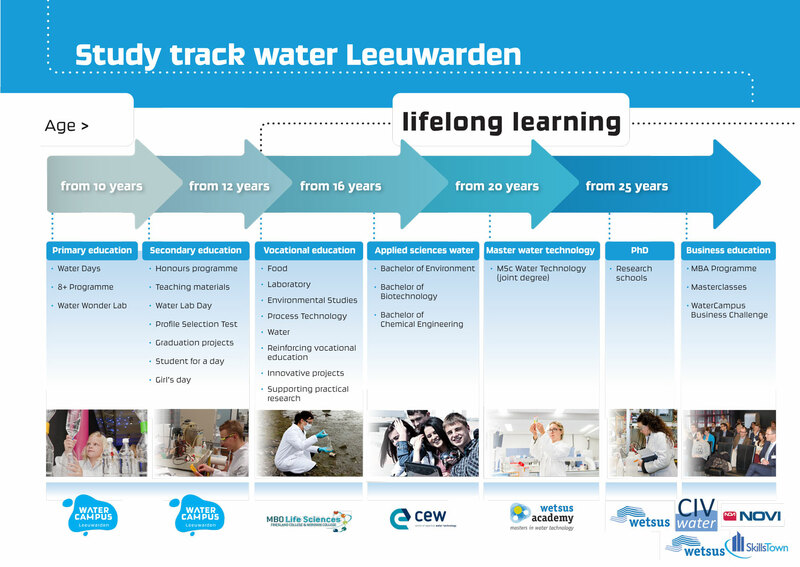 WaterCampus Leeuwarden plays an important role in training future water technologists and other water technology professionals. WaterCampus is the European meeting point for water technology talent. At WaterCampus Leeuwarden the best water related educational institutes in the Netherlands can be found, providing training on intermediate, high and academic level. Moreover, all educational programmes are linked to each other, providing great opportunities to move from intermediate training to higher education and from higher education to academic training. As all programmes anticipate on the demands of the industry, a challenging career is waiting for students after they have graduated. WaterCampus and its partners regularly have vacancies on all different levels. Often these are for PhD positions and other water technology related jobs, but there is also a regular need for support staff. In addition, there are plenty of (graduate) internships and side jobs. Keep an eye on this page to stay informed. Are you a student interested in water technology and are you looking for a side job next to your studies? Do you want to work for innovative research or the development of a product on behalf of a company? The Centre of Expertise Water Technology (CEW), CIV Water and the education institutes on WaterCampus offer various jobs, internships and graduation assignments for students at Intermediate and Higher Vocational Education and University level. At the WaterCampus you can find the following training institutions: MBO Life Sciences, CIV Water, Van Hall Larenstein University of Applied Sciences, NHL University of Applied sciences and Wetsus Academy (Master Water Technology). The WaterCampus organises and facilitates several open days, student shadowing days and excursions. The organisations based on the WaterCampus also provide internships, graduation projects or temporary and part-time jobs. During their studies, students take on real assignments from the industry. Together with students and knowledge workers, the Centre of Expertise Water Technology (CEW) conducts applied research and product development commissioned by a variety of organisations. This puts students in direct contact with potential employers. Wetsus has various internships and graduation projects available to BSc and MSc students.